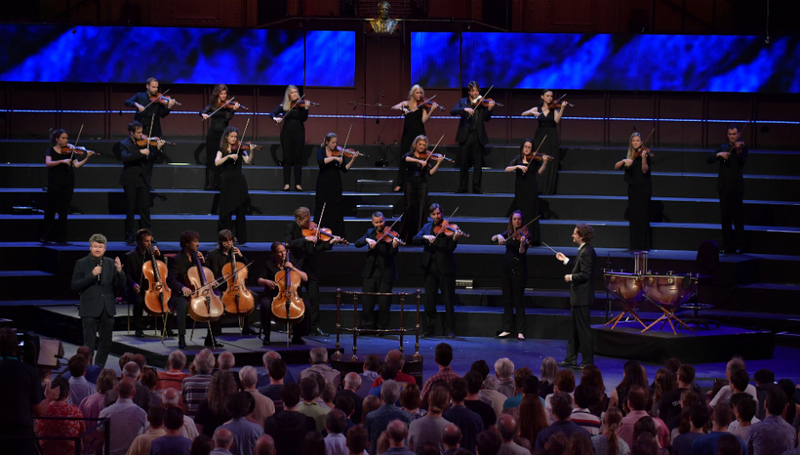 The BBC Proms – Can Classical Cut It In The 21st Century? Think of The BBC Proms and you probably think of the same few things: ‘Land of Hope and Glory’, ‘Elgar’, ‘Rule Britannia’; being bored out of your mind eating dinner on a Sunday night with your family, homework hanging like the sword of Damacles over your head; and, maybe, a whole lot of flag waving. But, in Post-Brexit Britain, with everything seeming just that little bit more grey and oppressive, is there still something we can all get excited about at The Proms? Can it still hold its own above the patriotism and the pomp and deliver a musical programme that both entertains and enriches? Can classical stay relevant in a world full of underground subcultures, increasingly unlimited choice and shrinking attention spans? We went along to Prom 21 to dig a little deeper. This year’s schedule boasts a staggering 75 performances culminating in the most well-known and well-publicised event, The Last Night of The Proms (held on Saturday 10 September 2016). It’s the spotlight shed on this particular closing ceremony that perhaps often threatens to overshadow the whole series, and more often than not, can be a misleading representation of what’s on offer across the broader programme. To the layman or casual listener (this writer included), the world of classical can be an intimidating place – it’s often antiquated and stuffy, while some might even go as far as to say elitist. What, then, are the BBC doing to ensure vital access to a rich world of musical for those of us who often remain on the outside looking in? Alongside batches of reduced-price and even free tickets made available on the day of each prom to those willing to chance it, there are also now outreach schemes through schools and special children’s events attempting to broaden the appeal of, and access to, The Proms for a wider audience. A glance around the Royal Albert Hall – admittedly one of the most beautiful venues I’ve had the pleasure of visiting – shows perhaps there’s still a way to go, as it’s undeniably still an overwhelmingly affluent, older, white crowd, but a progressive attitude is to be commended. Last year there was a special 1 Xtra Grime Prom featuring Stormzy, Wretch 32, Little Simz and Krept & Konan, with a policy described as “music is music” and an admirably open-minded approach to breaking down a few boundaries, but perhaps more needs to be done to integrate a multitude of people from different backgrounds and ethnicities into the programme as a whole, rather than consigning them to special nights and tickets. The billing for Prom 21 goes a little further towards dismantling some of the barriers surrounding classical to the uninitiated, breaking the mould of a conventional concert format at least enough to be considered daring in the world of starched shirts and bassoons, on the subject of which I’m still none the wiser – I wonder if there such a thing as simply an oon, without the bass? I’ve also never seen the need to starch or iron an item of clothing myself, except perhaps in the event of meeting Sir David Attenborough or getting run over by a bus, in which case I’d like to pressed within an inch of my life, for future reference. In the spirit of transparency, BBC Radio 3 presenter Tom Service and conductor Nicholas Collon introduce Mozart’s Symphony No. 41, deconstructing it and piecing it back together for the audience, opening up musical themes that allow a deeper understand of the composition and technical challenge for the Aurora Orchestra. First though, we’re thrown headfirst into a challenging piece of contemporary modern classical from Wolfgang Rihm, whose ‘Gejagte Form’ is alive with the fear of the chase. A rare event in that this piece of music is actually written by one of Germany’s most prominent living composers, it’s a genuinely disturbing and tumultuous piece of music that fairly grabs the listener by the throat and drags them through the forest screaming. Fans of any sort of progressive post-rock, instrumental music, or experimental electronica would be hard pushed to ignore how captivating it is – if Rihm were using Ableton and Logic instead of 100 year old pieces of wood to conjure up this hellish dash, he might well fit snugly alongside the likes of Aphex Twin, Squarepusher, and Venetian Snares. Strauss’ Oboe Concerto – ably and breathlessly demolished by the incredibly French and, tonight at least, decidedly excitable oboist François Leleux – is a little more traditional. Whilst considered modern in its 1945 composition date, it’s more along the lines of what one would expect from classical and The Proms, a rising and falling lyrical piece that was written at the end of the composer’s life. There are all sorts of parallels drawn between the Second World War coming to a close and a wistful sense of hope in the music, perhaps something we could all use right about now given the current climate, but it’s harder to connect with and less easy to be swept away by than Rihm’s rapid river of the hunt. The centrepiece of tonight’s bill is the performance – without so much as a page of sheet music – of the entirety of Mozart’s Symphony No. 41 in C major, K551 ‘Jupiter’. If you think that’s a mouthful, try playing the whole thing from memory, as the immensely talented musicians of the Aurora Orchestra do tonight. As a failed ex-musician with the most basic of grasps on theory, even I can appreciate this staggering feat of skill, more so after the brilliant aforementioned deconstruction that really does help the listener to navigate the piece. It also reiterates something that’s often true of real genius; when broken down into its component parts, Mozart’s music is astonishingly simple – the real skill lies in his vision of the complete piece, the weaving together of these tiny fragments of melody, tone and rhythm into a hulking beast of celebratory and grand classical. Whilst to many outsiders and casual enthusiasts The Proms may still seem somewhat inaccessible, in their striving to communicate an understanding of what makes classical tick, and their refusal to let it be consigned to the history books by re-engaging with a younger audience, the BBC are at least striding purposefully in the right direction. Let’s face it, if you can get a curmudgeonly 30 year old punk who mostly listens to instrumental rock and lo-fi DIY bands along and show him a good time, you’re probably doing alright.